1. What is Enago Learn? Enago Learn is an e-learning program comprising of various courses about academic publishing. The modules have been developed in collaboration with experts and provide information on the end-to-end process of academic publishing. Our courses are available in audio-, video-, and text-based format, you can also get your queries by industry experts (for some of our packages), and each aspect of the publishing process has been covered in this course. 2. Who has designed the courses for Enago Learn? Based on the expertise required for each course, our team has identified and collaborated with publishing experts, journal editors, and managing editors who have helped develop and design the content for the courses on Enago Learn. Each expert has >10 years on experience in the academic publishing industry. 3. Are the courses available in languages other than English? All our courses are available in English, Japanese, Chinese, Korean and Spanish language. 4. How do I know which courses I have been enrolled in? 5. Will I receive a certificate after completing each course? Step 3: You will then be taken to your Profile page, where you can see the certificates that have been issued to you. 6. Where are my personal details stored on Enago Learn? All details that you mentioned while signing up for Enago Learn are stored in the “My Account” section on Enago Learn. 7. Where can I find additional academic publishing resources? As a reference, you can read through resources about academic publishing on Enago Academy. 8. Who is Enago Academy? 9. Why use Enago Learn? 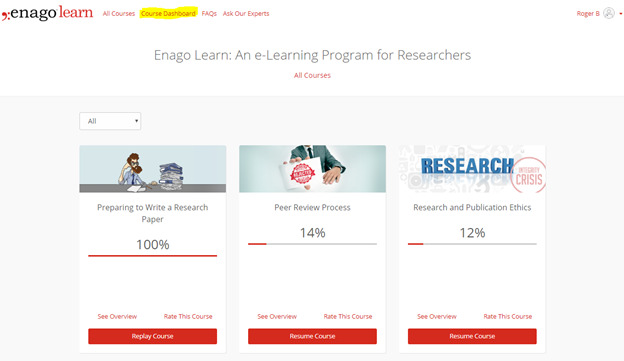 On Enago Learn, you will find information ranging from the initial process of writing a paper to promoting your research within your academic circles. Also, by having real-time access to updated information, you will be able to improve your understanding of requirements related to academic publishing. You can also access courses anytime, anywhere, and on any device. Also, you can ask questions to industry experts who can address all your publishing-related queries. 10. How do I change the site language on Enago Learn? Step 2: Click on the “My Account” option in the extreme right corner of the window. Step 3: You will then be taken to your Profile page, where you can see your personal details. 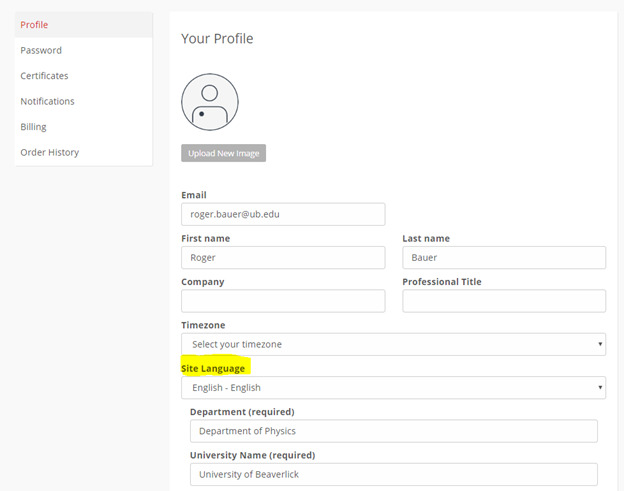 At the end of the page, you will see the option of “Site Language.” Once changed, you can navigate through Enago Learn in your native language. However, our courses will not be available in your native language. 11. From where can I receive the invoice for my purchase of Enago Learn? Any purchase that you have made on Enago Learn can be tracked through the “Order History” section page. There will be a specific order number issued to you for your purchase. To access the Order History, you will have to access your “My Account” section on Enago Learn. 1. Which browsers support Enago Learn? 2. Can I access Enago Learn on any portable device? Yes, you can access Enago Learn on your portable devices. You just need to use the e-mail ID through which you signed up on Enago Learn! Unfortunately, we do not have a mobile app for Enago Learn yet. 3. I cannot sign in, what can I do? For any difficulty in signing in, check if you have used the correct e-mail ID to sign into Enago Learn. If you cannot recall your information, you can write to us at learn@enago.com with your name and other details (university name and department name). 5. I have completed a course but haven’t received my certificate. Who can I contact? In case you haven't received your certificate, please check you have completed the complete course and achieved the minimum score in the quiz (70%). If you have done this and still receive an error, you can share screenshots with us at learn@enago.com. We will have your query resolved as soon as possible. 6. How can I unsubscribe from notifications issued by Enago Learn? We encourage you to not disable our e-mail notifications as they are scheduled to help you complete courses after you enrolled into them. These reminders on your activity and progress are shared on a weekly basis. Also, our notifications will share updates on the last content released on Enago Learn. However, if you do not wish to receive these emails, you should access your profile page on Enago Learn, then do the following: My Account > Notifications > General Notification Settings. 7. How do I use the “Ask Our Experts” section on Enago Learn? All your queries will be addressed to the e-mail ID you have mentioned in the form. The team will respond to you in 2 business days. All communication will be via e-mail. Given the number of queries we receive, it is not possible for us to arrange personal meetings with the experts. There could be questions that do not fall under our scope. We shall try and assist you in the best possible way for them. Note: “Ask Our Experts” is available for users using the “Premium” package. 8. Can anyone use “Ask Our Experts” section? “Ask Our Experts” is open to users of Premium Package only. To upgrade your package, you can write to us at learn@enago.com. 9. For certificates, do I have to complete all chapters for each course? Yes. You will not be issued a certificate unless you have completed all the chapters in each course on Enago Learn. If you have completed a chapter on Enago Learn, it will have green ticks across all the courses. 10. My university has acquired a subscription but I cannot access a course on Enago Learn? 1. As an individual user, how can I purchase Enago Learn? There are two possible plans currently available for Enago Learn: i) English Package and ii) Premium. In future, we will also be launching Premium Plus too. 2. What is the difference between English Package, Premium, and Premium Plus? Under the English package, you will have access to all our courses without audio option. Under the Premium plan, you will have access to courses in text, audio, and regional language too (Japanese (https://learn.enago.jp/), Chinese (https://learn.enago.cn/), Korean (https://learn.enago.co.kr/), and Spanish). Under the Premium Plus, we will be offering video-based courses too. Note: For purchases made on Enago Learn (https://learn.enago.com), all courses will be available only in English. 3. I have just purchased the English Package plan. How can I upgrade my plan? You can only upgrade by making the full payment for the upgraded plan (Premium). You can make the payment either via Credit Card, Debit Card, or PayPal. For other modes of payment, you can write to us at learn@enago.com. 4. Can I purchase individual courses on Enago Learn? You can surely purchase individual courses on Enago Learn. You can make payments either via Credit Card, Debit Card, or PayPal. For other modes of payment, you can write to us at learn@enago.com. 5. For how long do I have access to courses on Enago Learn? After purchase, you have access to our course for 6 months. 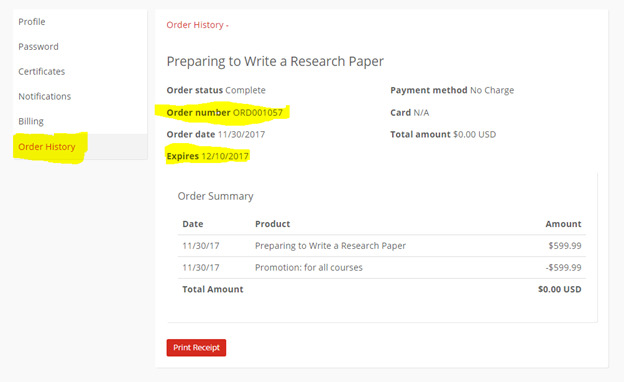 If you are unsure of when the courses will expire, you can get the date from the “Order History” page in your “My Account” page. 6. Can I renew my purchase of Enago Learn? All packages are automatically renewed after 6 months. If any new courses have been added, you will not have access to them. For individual courses, you will get access to all courses that you had initially purchased at the same price if you request for renewal. All renewal requests should be made 1 week before your course expires. You can write to the team at learn@enago.com for any queries. 7. Can I extend my purchase of Enago Learn? No. We do not provide extensions to your initial purchases. However, you can surely ask for a renewal. The fee would be same as that made for the initial purchase. 8. How can my university obtain subscription to Enago Learn? We provide customized payment plans for universities. If your university is interested in trying out Enago Learn, you can write to our team at learn@enago.com. Also, they can contact our team by filling out the “Request a Demo” request here. 9. Besides individuals, who can subscribe to Enago Learn? Generally, we offer subscriptions to universities, university libraries or departments for their students or faculty. If you want a customized option, please write to our team at learn@enago.com. 10. My university does not have a subscription to Enago Learn. Can I purchase an individual subscription? Yes. You can surely purchase an individual subscription to Enago Learn. 11. As an individual user, how can I purchase Enago Learn? There are two possible plans currently available for Enago Learn: i) English Package and ii) Premium. In future, we will also be launching Premium Plus. 12. Do you accept payments in Cryptocurrency? No. Currently, we only allow payments via Credit Card, Debit Card, or PayPal. For other types of payment options, you can write to us at learn@enago.com.